With the keynote of Eve Fanfest wrapped up, we now have all the details of what CCP is working on for the next year, including its new expansion: Into the Abyss. Into the Abyss’ Abyssal Deadspace is essentially Eve Online’s first single-player raid. Into the Abyss brings with it a huge new region for players to explore, Abyssal Deadspace. 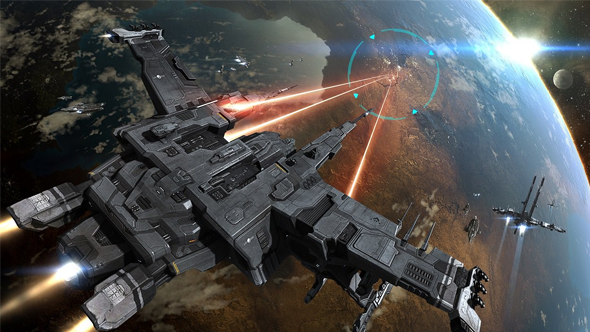 It’s a radical shift for Eve Online, an instanced location that can only be accessed solo. The raid is populated by extra tough enemies but the potential rewards are massive, with destroyed ships dropping blueprints and skills unique to the abyss. You can build those blueprints or train those skills yourself or trade them on the Eve market. On June 5th, anyone owning a station will discover it replaced with a faction structure. “If you want this you will have to take or defend the outposts and stations and hold them on the date of the change,” Nordgren said, essentially flicking a match into the fuel of Eve player rivalries. As a lot of the data that is now being captured to fill this tracker wasn’t previously being recorded, the tracker won’t retroactively fill with your entire Eve career. However, as soon as it goes live on Into the Abyss’ release date, the tracker will start updating with your movements. “We are also upping our efforts to deal with bots and hackers, who really don’t belong in Eve Online,” Nordgren says. This is an ongoing part of CCP’s private war with botters. The biggest cheer of the night went to the news that planetary interactions are getting a quality of life and UI overhaul. “There are many capsuleers who work with planetary colonies every day and some attention was well overdue,” Nordgren says. “We’ll have over 20 UI tweaks and quality of life fixes.” The details are getting filled out in an upcoming dev blog. Nordgren also revealed that the team are working to address the balance issues surrounding 500mn heavy interdictors and after that the team will move onto tweaking “underused ships”. CCP will start with the navy battleships.